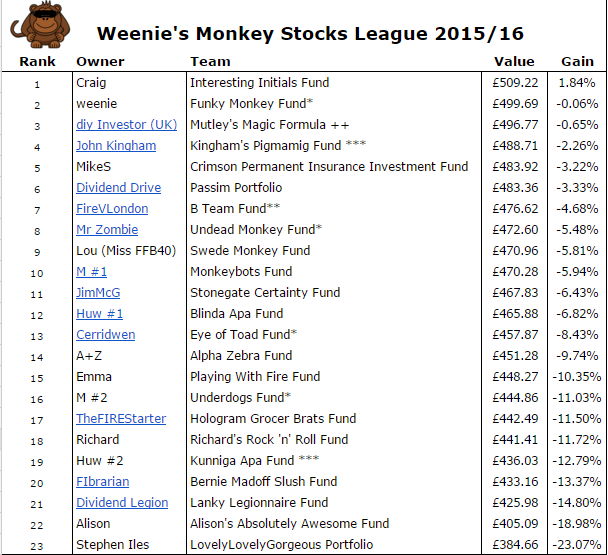 Monkey Stocks League Update #4 – Bear vs Monkeys! As the Bear Market came roaring out in January, what happened in the Monkey Stocks League Challenge? Looks like the monkeys got rather mauled by the bear…! Below is a snapshot as at the close of trading 29th January 2016 and leading the charge was the Interesting Initials Fund, the only portfolio showing a gain! All January dividends have been added to the respective portfolios. However, please let me know if I’ve missed any (or if there are any errors) as there are so many to keep track of. Mixed fortunes for the real portfolios – my Funky Monkey Fund is still up there, as is the B Team Fund and the Undead Monkey Fund, both still in the top 10. The Eye of Toad Fund and the Underdogs are bogged down mid-table and below. John Kingham’s Pigmamig Fund is still up there too challenging the monkeys, while Huw’s Kunniga Apa Fund is still wallowing near the depths of the league table! The best 5 performing shares since the start of the league are NMC Health plc, WH Smith plc, Compass Group plc, BAE Systems plc and Tate & Lyle plc. 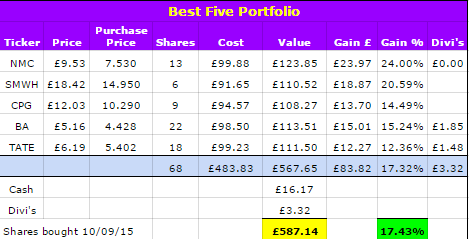 Interesting to note that last month, the ‘best five portfolio’ showed a gain of 15.87% – the Bear Market appears to have not had a detrimental effect on all shares. The worst 5 performing shares are AVEVA Group plc, Antofagasta plc, BBA Aviation plc, Nostrum Oil & Gas plc and Poundland Group plc. If you’d had the misfortune to pick this lot, you’d be sitting on a loss of -43.08%! 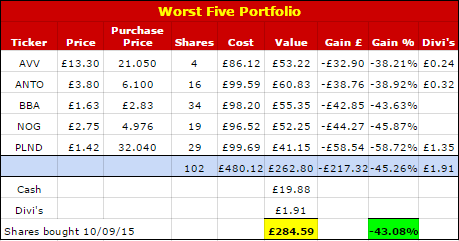 Last month’s ‘worst five portfolio’ was down by -32.27%, so these ones didn’t escape the Bear’s mitts! This entry was posted in Blindfolded Monkey, Blog Update, Dividend Investing, Monkey, Shares by weenie. Bookmark the permalink. This is turning out to be very interesting Weenie. I realise we are still only a few months in, however, I see that this exercise of picking companies out of a bag is following the same theme as other research into funds v trackers and also my own analysis of my individual shares and the work that goes in to beat the Vanguard Lifestrategy. The “Mutley’s Magic Formula” (Vanguard Lifestrategy 60) is currently sitting 3rd. It will be interesting to see what happens when a bull run starts. Thanks for coming up with this idea and implementing this league table, I for one am finding it fascinating. Yes, the whole ‘randomness’ aspect has made the very interesting and may yet show that it is all down to partly luck and not any particular skill! I was really surprised to see that the ‘best five’ shares had done better than in December – just assumed that all shares had gone down! ‘Mutley’s Magic Formula’ was actually leading for most of January, the final day’s rally pushed it into 3rd place. I’m glad I came up with the idea but am very grateful for everyone’s support in encouraging me to go ahead with it. Given me some ideas for next time, hehe! It’s moved around loads since the start of January, pesky volatile market hammered the Undead Monkeys. Your picks are still flying high! Yep, kinda fortunate with my picks but still 8 months to go and anything can happen! It’s cool that you have this simulation portfolio. I guess that’s why most people just do index fund or total market funds and call it for the day. That’s pretty what I do with my 401k. Then come the misfortune one that come at 43% loss. Well, I have actually got real money tied into my picks, as have a few others, but all the others are ‘virtual’ or fictitious portfolios. I think I would be a nervous wreck if all my investments were in single stocks, even though I wouldn’t be tempted to cash them in. Yes, that 43% loss would be very tough to stomach! I prefer to keep most of my money in index funds too, but like having a some picked stocks too for dividend purposes. Pulling money in and out just lines the pockets of stockbrokers!